The trial has begun in Cambodia of a man charged with killing prominent activist and government critic Kem Ley. Kem Ley was shot dead at a petrol station in the capital Phnom Penh in July 2016. Police said at the time it was a dispute over money. But there are suspicions that the murder was politically motivated. Political tensions have been rising between long-time prime minister Hun Sen and the opposition ahead of elections due in June. 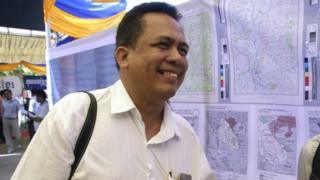 Kem Ley, a popular political commentator, was known for his criticism of political parties particularly Hun Sen's ruling Cambodian People's Party (CPP), which has led the country for decades. He had called for a new era of clean politics, and made moves to set up a new grassroots political movement. Days before his death he had commented on a report exposing the business dealings of Hun Sen and his family members. His death was widely mourned and tens of thousands of people attended his funeral. Some in Cambodia believe it was a politically motivated killing. The opposition leader at the time Sam Rainsy publicly accused the government of orchestrating Kem Ley's murder. The accused killer, former soldier Oeuth Ang, has claimed that he was not acting under anyone's orders, and that he killed Kem Ley for cheating him out of a sum of money. Cambodia became a multi-party democracy in 1993 but opponents say the prime minister runs a violent and authoritarian system. In February, the parliament approved changes to the laws which effectively prevent the prime minister's main rival, Mr Rainsy, from taking any role in politics. The laws bar anyone with a political conviction from running for office, and allow the Supreme Court to disband any party with a convicted leader. Mr Rainsy, who lives in exile, has a conviction for defamation, a case he said was politically motivated. He stepped down from the helm of his opposition Cambodia National Rescue Party (CNRP) last month ahead of the changes, saying he wanted to protect the party.